To fully unplug yourself from the matrix means that you are no longer being interfered with on an energetic level of mind, body and spirit level. It is important to fully understand that the way you look at Earth is in a three dimensional reality, or 3D. As humans we have been hooked up to a universal mainframe, a matrix through the various energetic seals, implants, mind control software programming, belief system modifications, DNA modifications and other energetic distortions. These energetic distortions have been put in place in a way that is somewhat natural to us, allowing us to basically live within the matrix and never really know or recognize that we are within it and are always being affected by it. This is simply due to the fact that we have always had these distortions, the frequency level of our mind and personal vibration is at a point where our consciousness shuts down and we remain in a controlled program. This essentially keeps us asleep and the various frequency distortions effect us in a way that creates our energy and consciousness to be siphoned by creating discordance and it creates blockages that stop us from connecting with our higher self and higher dimensions. Connecting to higher dimensional levels essentially is like moving your awareness into a higher perspective that is comparable to that of a pea, to the size of a planet. The Negative Alien Agenda are the ones that hacked our consciousness and changed our original divine blueprint from our 12 strand diamond sun DNA template (Angelic Human) to a 2 strand DNA template, leaving the other 10 strands dormant and deactivated. This stops us from realizing our true multidimensional self. Realize that we all have 12 strand DNA templates, however there are others known as Indigo’s (I myself am a Type 1 Indigo Adult) with higher DNA templates such as 24 and 48 strands, allowing the embodiment of 24 to 48 dimensions of consciousness. As it stands we are operating at a fraction of our limitless potential and are no longer able to access dimensions 4 – 12, or 13 through 48 if you are an Indigo. By removing all of these energetic distortions, seals, implants and various other energetic devices you will be able to access more of your higher self which will allow you to hold these frequencies here in the physical. The removal of these distortions releases the cap on your potential. You will begin to feel old patterns, negative addictions, thought processes and drama dissolving from your life as a result. Ultimately, you will receive a dramatic increase in clarity, awareness, psychic abilities due to the various seals and implants being removed from your bodies and auric fields and increased states of consciousness and much more. J-Seals are known on all levels of one’s multidimensional anatomy as the 7 Unnatural Jehovian Seals and other unnatural seals and implants that are within our mind-body-spirit system. Many people report physical problems in the exact areas where the seals are located and once they are removed, their health and experience of life improves significantly. These seals are talked about in many ancient texts. The seals activate in response to Stellar Activation Cycles (happening now) and when the seals activate in the body, they can manifest in physical illness if they are not cleared. These seals are responsible for many of the pains and problem areas that people have on the left side of their body. Many with Jehovian Seals, Unnatural Death Seals, Crown of Thorns, Tower of Babel Seal, Metatronic Seal, Cell Death Programs, Zeta Seal. All human beings are born with energetic distortions in the human body known as unnatural seals as they were NOT created by Source/God. All human souls incarnating since 1748 A.D. have this Zeta Seal block in their 4th DNA strand. This block created an unnatural blockage between the higher self aspect of identity and the dimension for astral awareness. This blockage manifests as greater fragmentation which causes issues in remembering out of body or astral travel and causes heart chakra blockages and represses natural and intuitive senses. So this made it easy to influence human behavior as it connected the human DNA directly into the Zeta collective mind complex that controls population. The name metatronic is in reality not the name for these implants, as they are at a crystal frequency and prevent many energy bodies from fully reconnecting as well as fully integrating and merging within the human physical body. The crucifixion was an energetic crucifixion to humanity as the crown of thorns scrambles the Universal currents to our chakras keeping humanity stuck in a 3rd dimensional frequency fence. While this is being cleared, highly sensitive individuals see a metal plate being removed from above their head or taste metal in their mouth. You experience a deeper connection to Source consciousness and your Higher Self. On the other hand you are not actually stuck on the wheel from which it is a bit more complex to get off. Therefore as you can see it is both good and bad. Once removed though, what happens is you are removed from the matrix. Does it mean you fall off the face of the earth? Absolutely not. What this means is you simply are able to SEE beyond the veil, you are no longer feeding the “dark” side, nor feeding the matrix as the “dark” side wanted you to feed. You are able to then freely move between worlds, see beyond, think beyond, and through your thinking, through your newly acquired truth energy of love and light you are then able to weave a new reality into being, hence assisting to build a new matrix of love, or lack thereof. It then becomes up to you. As you become incredibly powerful as you truly are. You are able to co-create a reality of your choosing. Auric attachments can cause severe limitations in the evolution of both spiritual and physical aspects. People often spend many years reading self-help books and seeking out the assistance outside of themselves. These energetic blockages commonly manifest as pain and disease within their physical body. Many types of auric attachments will also continuously attract us to the people, places and events with the same type of low frequency. This causes us to continuously experience difficulty in manifesting a much more desirable reality. To break away from these repeated cycles, we must transmute the negative attachments from all 15 levels of your awareness. This includes the neural brain networks associated with them so the repeated patterns can stop becoming solidified as more emotion is put into them. Karma is inherited through our parents and ancestors through the process of birth and greatly holds us back from experiencing our true multidimensional self. Many people struggle day to day with things such as lack and limitations concerning prosperity, abundance and love. Most people walk around daily completely disconnected from their higher self. It is for the reasons above why our negative reactions and emotions are not natural. They are being triggered due to the various underlying energetic properties that are within our energetic system. When all of these various karmic imprints, energies, personas of the shadow self and more are removed from us, we can begin moving forward into our full multidimensional self. This allows us to find the joy in life because we no longer react to other people’s nonsense. We simply are receiving clear guidance from our higher self. This allows us to live in a place of harmony and peace. You will not have to worry about unexpected emotions and outbursts or reactions to the world around you, because a light we be restored within your DNA template divine seed blueprint to aid you in the process of clearing. The personas of the shadow self cause great difficulties in the realization and expression of your full Avatar and Christos Identity. These personas are created by the anchoring of various energetic distortions and or reverse frequencies running through your Personal Grid and DNA Template. Clearing these karmic imprints and personas that no longer serve you in this session will result in experiencing much more physical, emotional, mental and spiritual freedom. The 15D Karmic Clearing Session involves clearing the karmic imprints and energies from your energy field and ALL 15 LEVELS OF AWARENESS and replaces them with positive reinforcement, healing energies and illuminated consciousness that is tailored to the unique energy and vibration of your soul at this time. So what exactly is the “Persona” and “Shadow Self”? The Persona, according to Jung, defines what we would like to be and how we wish to be seen by the world. The word “persona” is derived from a Latin word that literally means “mask”, however in this instance the word can be applied metaphorically, representing all of the different social masks that we wear among different groups of people and situations. The human nervous system is instructed by key areas of the planet due to the implants that are being used to release life-force (chi) energies. The siphoning and control over the population is then given to this network through the body parts and are used to override or run programming in your physical body. One’s mind is controlled by whoever has control over one’s thoughts and controls the direction and actions of the entire functions of the physical body. What influences the physical body are the actions that lead to the control over thought forms and belief systems. After you’ve received your Matrix Unplugging Session, you may continue further with activating your dormant strands of DNA. Know that I am always here with any questions you may have and if you would like more information on the 12 Strand DNA Activation Session, this page explains in better detail and will allow you to absorb it fully until you are ready to move forward with the session. If you are interested in dramatically advancing your DNA template, the Premium Package includes the Matrix Unplugging, 12 Strand DNA Activation and Golden DNA Activation Session, this page explains in better detail about the session which activates all 144,000 golden strands found within the 12 Strand DNA activated template. This is 3 sessions separated by 7 days each and will enable you to accrete liquid golden light from the Golden Liquid Realms of Absolute Harmonic Universe. Basic is the Matrix Unplugging Session. This session removes all of the energetic various blockages that are not covered within the J-Seals and unnatural implants removal session and prepares you for natural DNA activation. Standard is the Matrix Unplugging Session and 12 Strand DNA Activation Session. This session is designed to remove all of the various energetic blockages and accelerate your DNA activation process. 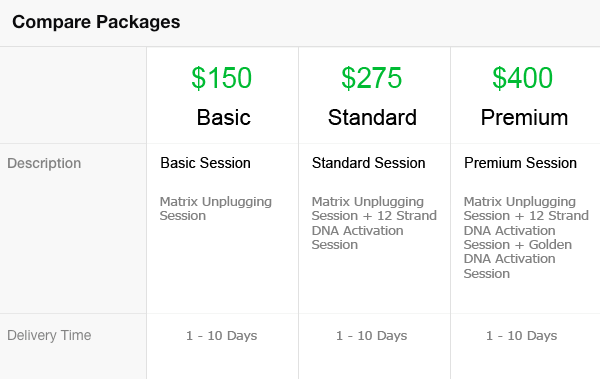 Premium is the Matrix Unplugging Session, 12 Strand DNA Activation and Golden DNA Activation Sessions. This session is designed to dramatically propel you into higher states of consciousness by removing all distortions and activating your angelic human DNA blueprint to it’s maximum capacity. Testimonial written on 03/16/19 for Matrix Unplugging recieved on 02/17/19 and 20D Cord Cutting done on 03/06/19. Thanks to Jaye, I am unburdened of some negative emotions and thought patterns/belief that were on causing me to be unhappy and very reactive. I am now calmer, less triggered and better able to speak my mind and set boundaries without fear of disapproval or rejection from others. I still have a looong way to go and with Jaye’s help I’ll get there sooner rather than never. Jaye is also honest. I was on the fence about doing Reptilian Overlay Removal, I asked Jaye to check(he did this for free) and he told me I did not have a Reptilian Overlay and that receiving services I don’t need will not help me. I trust Jaye and have already referred my husband for the Full Energetic Test. My husband is doing the 20D Cord Cutting tomorrow 03/17/19. I also did the Chakra and Kundalini Removal with Jaye on March 15th and will leave another testimonial for that in a few weeks. Outstanding! Colors of healing go though me all the time. After having had the Karmic clearing and Angelic Ray Sword clearing and protection session, I was so looking forward to this session, bear in in mind that the extreme skeptic in me had completely vanished, thanks to Jaye’s excellent sessions on me. During this session, I experienced some pain in my wrists and thigh and right rib, but nothing major. I also felt mostly cold sensations and a hot one once. I also felt slight pushing and pulling and one point also felt like I was being lifted off the ground and it felt wonderful! I felt a ton lighter immediately after the session. I also feel more calmer and more focused. I am beginning to find colours brighter and so much more in tune with nature! Jaye has been an absolute professional with swift responses and checking on me after each session to ensure I am ok. He is also very gentle and understanding. I continuously bombard him with question after question and he provides detailed explanations EVERY single time! Not once has he got mad with me for asking so many silly questions. I’m sorry Jaye and thank you so so much for all your help until now! I would just say this much to anyone reading this message: Go for it-you have definitely come to the right place with Jaye!! I turned to Jaye because I really wanted to remove my chakras and kundalini. However, when I looked at the healing services that he offered, I decided to go ahead and do the matrix unplugging session first. With that being said I was a bit paranoid because almost a year ago I worked with a woman who wound up being a spiritual fraud and ran a ton of reversals on me (i.e. she slapped a bunch of implants on me instead of removing them from me; word of caution: please beware of this phenomenon. There are some dark spiritual “leaders” out there, who harvest their followers’ energies by running reversals in attempts to keep them trapped within false ascension matrices). Anyway, after talking to Jaye some more and realizing that he was of light, I went ahead and booked the session. Jaye was even able to “see” what that dark woman did to me. During the session I could sense him pulling out all those implants out of my body. Not only did he perform the matrix unplugging session on me, but he also removed a lot of artificial and inorganic tags from me that were put upon my being by that spiritual fraud and master manipulator in disguise. I lay there for 2 hours. I sensed how he was pulling some sharp things out of me. Some of them had been there for a while and used to cause a lot of discomfort and limit my range of motion. When Jaye removed those implants from those areas, I felt aches and pains. I even teared up. During the session, there was some energetic/emotional purging too. Some sad memories from the past came up and were released. I felt a bit exhausted after the session, but woke up feeling really refreshed the next day and was even able go for a run: the joint aches were gone. Jaye told me to wait a bit to leave a review. It’s been three days now, and with every day I’m noticing greater shifts. Like he said, the colors appear more vivid, there’s more depth to the surrounding environment, there are also some physical symptoms and detoxing that’s going on. I feel less depressed, more motivated, and it’s been easier to shed the victim story. It’s an amazing session, and it’s something worth doing! Jaye has been really incredible and I can’t say enough good things about him as a healer. Spirituality is a new realm to me, and parts of it are scary and confusing because I’ve made some spiritual mistakes. I had a lot of questions. And Jaye is super helpful and patiently responds to all of your questions. And I can sense that it’s because of his genuine desire to help. After the matrix unplugging session, he even helped me with the removal of some other dark (occult) stuff that the dark woman was still doing to me. He then added layers of protection to help me overcome her harassment. It was so much needed, and I am so thankful to him for this kind of help and healing. This session was intense. I felt energy buzzing in my hole body. One period I was in another state of consciousness. I really was somewhere else… Great session as always! Jaye Pause’s healing is totally amazingly miraculous! I have now undergone several of his healings, including the Matrix Unplugging. First of all, the very week that I got this healing, I mysteriously got three new clients… So, this healing is connected to prosperity and abundance! Yay! Then, as I healed to get ready for the next magical healing, I got some more mystery money, exactly 9 days later!!!!! Some other occurrences that happened from Matrix Unplugging included: feeling blissful and maintaining a calm groundedness…. I also began to experience super creative surges, for work and play!!! Just from the Matrix Unplugging alone, I began to create 8 to 10 drawings PER DAY, instead of the average 1 per week, which is phantasmal! Okay, then after I got the *Matrix Unplugging* I got the up-and-coming *Mirror Healing* which places meta-auric-high-dimensional mirrors around the body and auric layers for protection…. First of all, I woke up from the Mirror Healing totally blissed out….with waves and waves of happiness all over me. Then I noticed, the next 9 days or so….then the next month or so, that I NO LONGER felt any negative emotions! Wowza, what a game changer, right??? Jaye Pause is a Lightworking Shamanic Magical Miracle worker! His healing can change your life! At the start of the matrix unplugging session with Jaye, there was slight vibration in my left ear. Then I experienced many anxious, repetitive thoughts, followed by a pulling sensation in my right abdomen. Then more anxious repetitive thoughts presented themselves. At some point, a semi-lucid dream began (I no longer remember the details of this dream). Then I felt as if I was sinking downward into the earth, and I decided to go with that feeling. After that, I fell asleep completely. I had a dream in which I woke up and couldn’t see clearly & couldn’t open my left eye. Within the dream, I started to panic about this, trying to figure out why this happened and how to fix it. Eventually I managed to get my left eye open. I woke up from that dream within the dream and entered another dream, in which I had overslept and missed my next appointment. I briefly work up in real life, saw that I hadn’t actually missed my next appointment, and fell back asleep, still anxious. My alarm woke me up, and Jay suggested that these dreams and anxieties during the session were exemplifying the process of blocks and traumas being removed. A few weeks afterwards, I began to feel more open and more okay with things in life. I’m beginning to process certain traumas on a deeper level, which is useful for healing. I’m definitely hoping to continue to experience positive effects of the matrix unplugging over the next few months. I don’t typically have lucid dreams, and I rarely have dreams-within-dreams — this experience was directly correlated with Jaye’s work. I highly recommend him! AMZING experience! Excellent communication, Jaye was quick to respond back to my emails and answered all my questions. During the healing session I felt a lot of tingling heat moving through my body I even fell asleep for a while lol. I can feel my vibration changing. I will definitely be coming back for more healings. I purchased the Matrix Unplugging session from Jaye Pause, at first I was quite skeptical because I had a hard time believing that someone could remotely heal your avatar and energy body. Eventually however I gave into my intuition and decided to make the purchase. At first I didn’t notice much, but it took a few months to feel the full effects, I started to feel more alive then i’ve ever felt before, everything seems more vivid to me, and it is much easier to meditate and get into the present moment. I have also been getting a lot more downloads from my higher, so much thanks, with love and light to Jaye Pause, and I hope to do more business with him in the future, for all of those that are thinking about purchasing his energy healing services I very much recommend him, he is a very nice man and he will always answer any questions you might have about his services, and reality. Thanks again, much love and light to all! 2 weeks ago, I had a session with Jaye for my “Unplugging of the Matrix “. Before my session, Jaye informed me that the session may get intense as others had experienced. Knowing days in advanced, I asked my Higher Self to help guide me in preparation. Two-days prior to my session I started grounding myself and drinking lots of water. At the time of the session I called upon my Higher Self to assist in making the energies comfortable. Sure enough, the energies I experienced during the 2 hours session was beautiful. The energies twirled through out my body however in a mild sensation and at other times felt some intense energy however it was comfortable. Since my session 2 weeks ago, I have been experiencing some clearings, as Jaye did mention they may arise. Some days I just wanted solitude for a couple hours, other days, Id be so sensitive I cry a lot. The emotions that were arising were beautiful. Unconditional Love and compassion overflowed in and out of me. To make things even more exciting, 2 days after my session was the New Moon. So much energies where being experienced. 1). When I go to bed and be still, the energies are still being felt…meaning I can still feel the energies go all over my body. Its certainly amazing. 4) I feel so blissful, I feel so light, and The energy of Love flows thru and around me all day. If you’re thinking about this session, I Highly Recommend the “Unplugging Of The Matrix” with Jaye. Ive worked with a couple healers before however non of them comes close. As a distant healer, Jaye’s is Amazing! Interesting process! Now that certainly rocked a whole lot for me, a single session that over the course of many days has removed a bunch of programmings, conditionings, ego thoughts or other forms of un-productive mental constructs. I am now sick with ascension fever as my body is somehow naturally purging toxins and pollutants I was stuck with. Feels good to have a load of implants, seals and other anti-human constructs lifted out of my subtle bodies, nothing to weight me down anymore besides myself, much easier to deal with things now eh? My Matrix Unplugging Session started early. I first felt weird plucking sensations, sharp pin pricks and gentle feelings of being touched in different parts of my body, especially in the shins & calves, arms, stomach & head. Light bands of energy began swirling up each of my legs, starting low & over the next 2 hrs moving up and around the rest of my body. At the same time, I felt strong bands of energy swirling all the way around my body, tightening in a cocoon of vibrating energy. I felt like I was suspended on a vibrating cushion of light & powerful energy. I felt intense & deep sensations of healing and release. I saw beautiful swirls of purple and intense gold and rainbow matrix patterns of which I was a part. One with the Universe, I felt bonds broken and light filling the void. An intense energetic healing and enlightening experience. I’ve participated in several of Jaye’s other offerings and found each one to be highly effective, and this Matrix Unplugging Session far surpassed my expectations. I highly recommend this and anything else Jaye develops, as I can personally vouch for immediate positive and effective results! I feel like Jaye works very diligently to bring forth profundity healing to the planet. Behind left ear & as well as pineal area also heart but these were subtle. I did see an old false light healer I worked with years back moving out of my field. Also though the detox the last 48 hours has been quite intense emotionally for me personally. So make sure you have time to address emotional if that is your thing. Also make sure you know how to work with your 12 D shield so you can contain yourself from the intrusion going forward. Spiritual housekeeping is a MUST. It started slowly and gently up my legs and spine, then my neck and face, head, eyes and ears, never had eyes and ears before. I had visions and experienced all the emotions. hate, fear, anger and incredible love. he told me I am loved and I am going to be okay. A tide of fire shot past me, then I saw bright white light and felt light and at peace. Golden light and purple light. The tingling did get too intense at one point like being stabbed with fire pins. I asked for it to calm down and it did. My chest was on fire. and eased off. I feel great, loved and at peace. I saw myself and sat with myself and we held hands. We smiled at each other. weird! I seemed to be floating and watching and feeling everything my human self was. This was so strange and nothing like I expected to happen. 4 hours have past and I am still feeling it.